Rio de Janeiro is a vibrant, energized city known for its beaches, food, nightlife, breathtaking views from atop any of its high peaks, and culturally-rich mountainside favelas. If you’re looking to live life in Rio like a local, we recommend staying in Santa Teresa, the city’s hip, boho neighborhood that we’ve heard many locals refer to as the artistic hub of the city. The winding cobblestone uphill streets are dotted with restaurants, cafes, and shops. You’ll find locals selling their wares on the streets and in stores, and a plethora of restaurants and cafes in which to relax and take a break from the hustle of the big city below. Within Santa Teresa, Cultivar was one of our favorite hangout spots. Pretty non-descript in its ambiance, it was a great, casual place to interact with Brazilians and enjoy some of the most affordable street snacks we found in all of the areas of Brazil we visited. Regardless of the time of day, locals head to Cultivar for big bowls of icy cold acai and chewy warm, gluten-free pão de queijo made with tapioca flour. 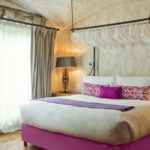 If you’re looking for a unique bed and breakfast in Santa Teresa, look no farther than Casa Cool Beans. There are many non-distinct hotel chains located in Ipanema and Copacabana, but we appreciated being removed from the really touristy areas of Rio at Casa Cool Beans. David and Lance are the friendly, American owners of Casa Cool Beans. They opened Casa Cool Beans after having both taken separate trips and fallen in love with Rio in the 1980’s. Lance’s many years of hotel management at The Four Seasons Hotel & Resorts and David’s outgoing nature and the fact that his parents had settled in Brazil, made opening a B&B there a natural and fitting next step for them to take together. 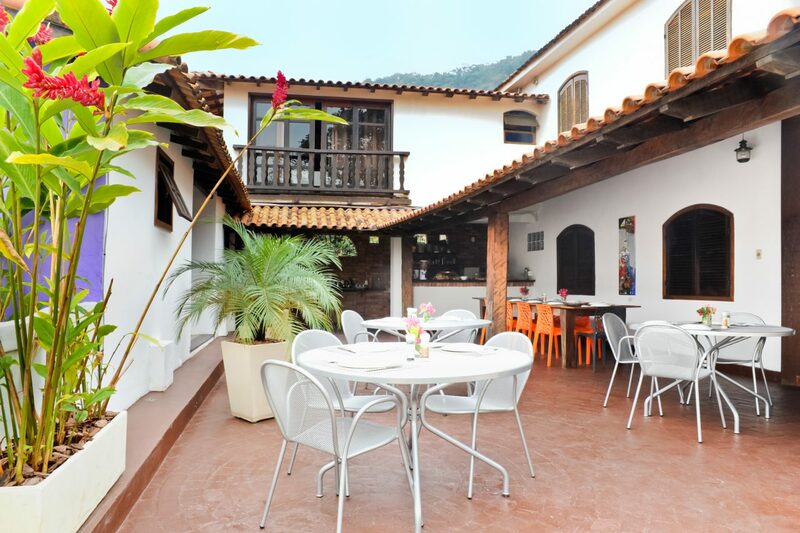 They picked Santa Teresa for its history and charm. As you walk around the neighborhood, you’ll notice large homes tucked atop the winding, narrow streets. When the Portuguese ruled Brazil, the ruling class moved away from the beach area to escape the heat in breezier areas, like Santa Teresa. You can see remnants of this era in the Portuguese architecture and tiling around the neighborhood. As for the building that Casa Cool Beans is in, it inhabits one of the only Spanish-style homes in the area, so Lance and David suppose it was built by a Spanish family in the 1930s after a fire destroyed a Portuguese structure that previously stood in its place. Interesting tidbit: Cirque du Soleil previously owned the property as a practicing ground. If this place was cool enough for Cirque du Soleil, it’s certainly cool enough for us;)! 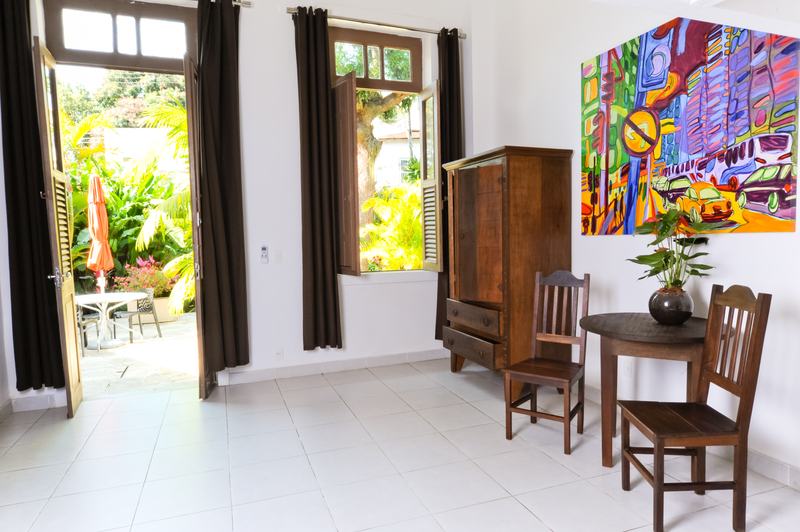 In opening the B&B, it was important to Lance and David to create an oasis for guests to feel they have a “home” in Rio. 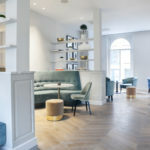 The rooms are situated around garden areas, and feel private, while taking breakfast on the patio feels like you’re dining in the outdoor area of someone’s home. 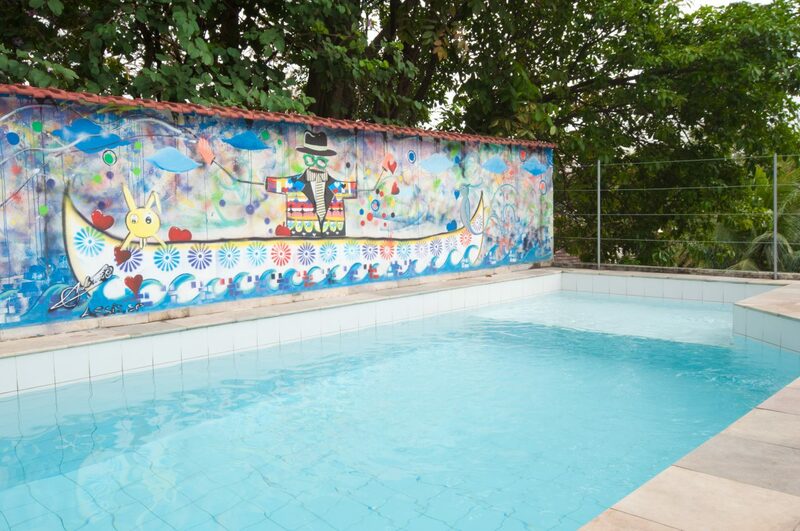 They’ve decorated the rooms with creative touches from local artists, the art not overdone at all, but instead serving as small, colorful reminders that you’re in Rio. They hired Sergio, who they label (and we agree) ‘the BEST Manager ever’. He is a local Carioca who speaks impeccable English and has a really kind and knowledgeable presence. From offering you a parasol, or sun-brella as we like to call it, to helping you plan local tours, Sergio couldn’t have been more friendly or helpful. All of the staff feels close-knit like a family, and does their best to prepare you for a comfortable and safe stay in Rio, even welcoming you to Santa Teresa with a free drink two blocks away at the neighborhood’s most popular bar (and also an Anthony Bourdain favorite), Bar do Gomez. Customer Service: The hotel’s customer service is at the foundation of what makes Casa Cool Beans an exceptional place to stay during your time in Rio. Upon arrival, you’ll be greeted in person by the hotel staff and have everything about the hotel, the room, and the neighborhood explained to you in great detail in order to get you quickly acquainted to the area. We especially appreciated David’s descriptions on how to stay safe in Rio. 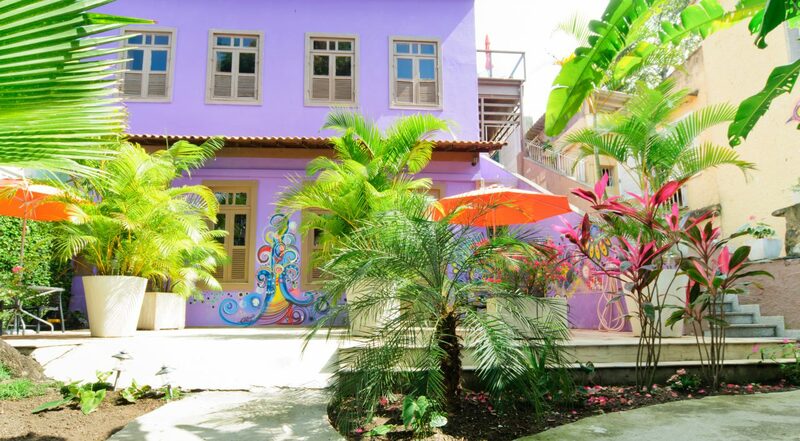 Location: We loved exploring Rio on foot to discover the artsy Santa Teresa neighborhood. There are multiple restaurants, cafes, bars, and boutique stores within a few blocks of the hotel. Breakfast: The hotel’s breakfast is perfect – it’s hearty and the offerings are extensive. It’s a buffet of meats, cheeses, homemade breads and pão de queijo, local fruits and fruit juice, coffee, tea, water, and hot chocolate. You’ll also be served something warm and homemade – the offering changes each day, but can include scrambled eggs, omelettes, and pancakes. We love how friendly the breakfast staff is as well! AC! Rio can get unbearably hot and sticky. The room fridges are stocked with water, sodas, and beer that are very similarly priced to what you would get down the street at the store. We enjoyed being able to have drinks in the room without paying a massive mark-up for them. The rooms are stocked with local bath and body products that are also available for purchase. Pool & Terrace & Views: The hotel pool sits on the third level of the hotel property. It has a spacious terrace area perfect for laying out, soaking up the sun, and sipping on wine. The terrace offers mountainside views of the neighborhood. Walk up the hill a little to bit to get an elevated ocean view of Rio. PRO TIP: Ask to book Room #7 for a room with a balcony or Room #9, which has the great views from the 4th floor. Safety: A feature on Rio wouldn’t be complete without mentioning safety. 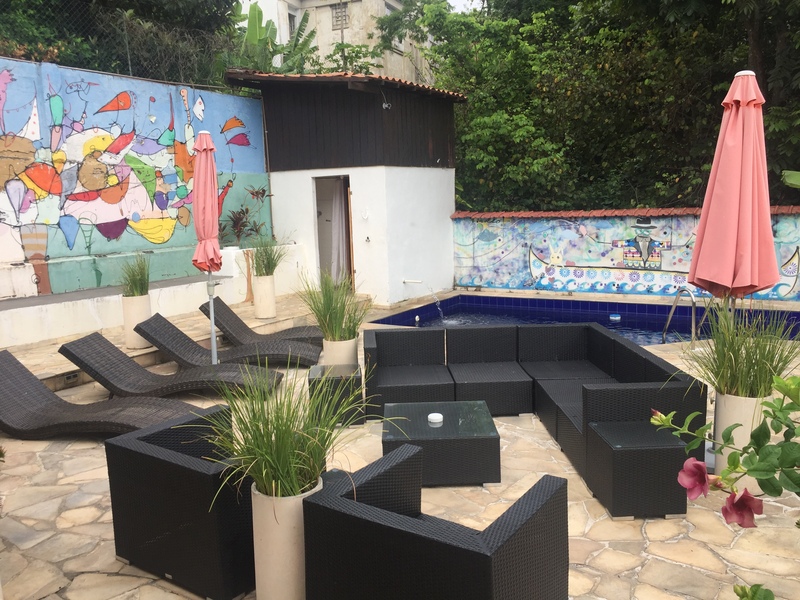 Casa Cool Beans welcomes its guest with a realistic and helpful approach to touring Rio in a way that focuses on acting in a way that draws the least amount of attention to oneself in order to be safe during your time in the city. The staff at Casa Cool Beans recommends going out without bags, cameras, watches or jewelry, and dressing down. Lindsay and I both roamed the city using these tips and we had no issues. 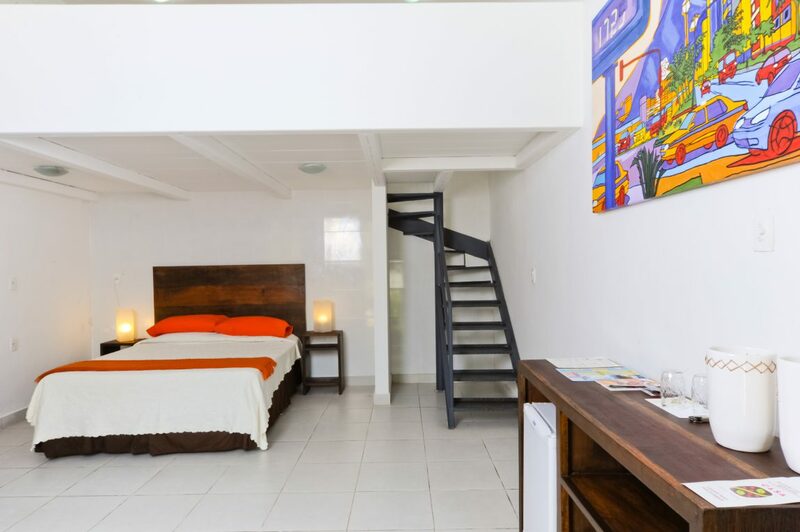 Enjoy your stay at Casa Cool Beans and the breezy ease and quirkiness of Rio’s Santa Teresa neighborhood. Let us know your favorite sights, sounds, and flavors in Rio in the comment section below!